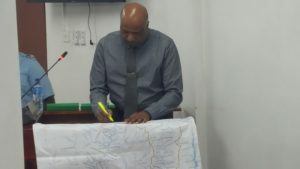 Police Commissioner, Seelall Persaud marking off locations on a map at the Commission of Inquiry into the Lindo Creek massacre. The map is part of the evidence at the probe that has been commissioned by President David Granger. Police Commissioner Seelall Persaud on Tuesday denied that he and several other policemen were responsible for killing and burning several miners at Lindo Creek, Upper Berbice River in 2008. Appearing before a Commission of Inquiry, Persaud- who was Crime Chief at that time-recalled receiving a map of the nearby Christmas Falls area and instructions from then Police Commissioner, Henry Greene to head into the area to arrest heavily armed gang, headed by now late Rondell “Fineman” Rawlins, that had been responsible for several murders and robberies. The one-man Commission of Inquiry is being conducted by Retired Justice Donald Trotman. After a shootout that led to the death of a Otis “Mudduh” Fyffee, he said he was instructed by then Police Commissioner Greene that he and his team should leave the area and return to Georgetown, and that a Joint Services team would be deployed to the area. Persaud said on June 5, 2008, he and six policemen, accompanied by a number of civilians who knew the area, left Georgetown by road for the area. The others policemen were Assistant Commissioner, Clifton Hicken; Deputy Superintendent, Withrite; Inspector Layne, Inspector Narine, Assistant Superintendent Lowenfield and Deputy Superintendent Nurse. He said the station diary would have a record of the movement of the police ranks at that time. “I was in charge of the operation. The instructions I gave to Assistant Commissioner Hicken were the instructions I got from the Commissioner of Police,” said Persaud. At stake was a reward of GY$20 million. On arrival in the area the same day on the right bank at Christmas Fall, Persaud said the team slept overnight in the area and the following day, Hicken and a team crossed the 200-feet wide Berbice River by boat to the left bank. Shortly after, Persaud said, he heard rapid gunfire after which he crossed the river and observed the body of Otis “Mudduh” Fyffe with a gunshot injury to his face. “As they approached the camp, they came under heavy gunfire and returned fire,” he said of the encounter at a forest concession that he said he was later told was owned by Phillip Bynoe. Seelall said nine firearms including rifles, shotguns and handguns as well as a quantity of firearms were recovered from the scene. The then Crime Chief, who is on pre-retirement leave, said after then Police Commissioner Green “called me back and instructed that I withdraw from the area and that the Joint Services will be deployed”, they did not proceed further. “My ranks were not at Lindo Creek. They were at Christmas Falls. I am sure they were not there because we left on the 6th (June, 2008) and arrived on the 6th,” he said. Overall, he added that he never had an opportunity to visit Lindo Creek. Persaud said he was unaware if there were any other members of the Guyana Police Force in the area at that time, and he was not aware of any other information about the subsequent deployment of the joint services in the area. Under examination by Attorney-at-Law, Patrice Henry for the Commission of Inquiry, Seelall eventually could not say categorically whether Pathologist Dr. Nehaul Singh had conducted the autopsies when he was told that there was no post mortem report in the file and Singh did not arrive at Lindo Creek. At the same time, Persaud said based on gunshot injuries and blunt trauma, it is clear circumstantially who killed the miners. Inquiry Commissioner Justice Trotman said he was surprised that the Director of Public Prosecutions had closed the case, while the outgoing Police Commissioner said he was not. Persaud:”I was not surprised that the DPP asked that the file be closed”. Trotman: You were not surprised? The then Crime Chief could not say whether Guyana Fire Service investigators had been dispatched to the area to ascertain whether any chemicals had been used in the fire. Against the background of several relatives of the deceased having already testified that the Guyana Police Force buried their remains without informing them, Persaud said they were taken to a funeral parlour. He said deoxyribonucleic acid (DNA) tests had identified three relatives- Torres, Bonny Harry and someone else he could not remember. Relatives of the five others, Persaud said, had been contacted based on circumstantial evidence and the mining camp’s owner whose relatives had also been at Lindo Creek. At that time, Persaud said he had instructed that the families be contacted and work with them to dispose on the remains. He said one of the families was contacted but said that burial would have been too expensive and instructed that the police dispose of it. Owner of the Lindo Creek mining camp, Leonard Arokium on June 21, 2008 discovered burnt skulls and other skeletal remains of several persons there. When results of DNA tests had been returned years later from Jamaica, it confirmed that those killed were Dax Arokium, his brother Cedric and workers- Compton Speirs, Horace Drakes, Clifton Wong, Lancelot Lee, Bonny Harry and Nigel Torres.